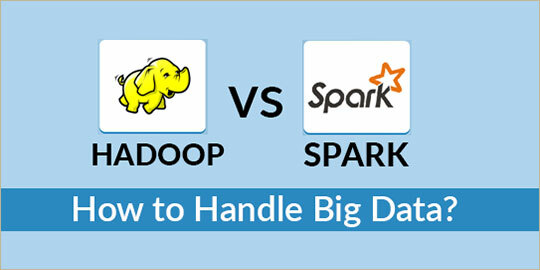 Hadoop vs Spark - How to Handle Big Data? You are here: Home > Tutorials > Programming > Hadoop vs Spark – How to Handle Big Data? The Experts also mentioned that IBM will proceed to put more than 3,500 IBM researchers to work on the Spark-related projects. According to Technavio’s market research analysts, the global Hadoop market is predicted to grow at a compound annual growth rate (CAGR) of more than 53% over the next four years (2016-2019). Now, having read the current growth trends in both the Apache’s open source technology platform- Hadoop and Spark, we could conclude their competency is no less than one another. So, the clutter here is what to choose for managing the big data explosion. The selection depends on several factors, which directly concludes to knowing the difference in features and implementation. See below how Hadoop and Spark are comparable and how can they help you differently. Although appertaining to large volumes of data management, Hadoop and Spark are known to perform operations and handle data differently. The former is essentially a distributed file system (HDFS) to store any type of data from any number of disparate data sources, delivering high performance, scalability and agility. As Hadoop distributes the massive data across multiple nodes within a cluster, it doesn’t need any additional, outside custom hardware to maintain. On the other hand, Spark does not support distributed storage but allows data reuse on those distributed collections in an array of applications. It rather works on RDDs (Resilient Distributed Datasets), which provide excellent mechanisms for disaster recovery across clusters. Well known for HDFS and MapReduce, Hadoop comprises two core components, one for storage and the latter for computing. Thus, this big data platform does not require Spark to perform data processing. Similarly, Spark can also be implemented without Hadoop. Even though there isn’t any in-built file management system in Spark, you can employ other cloud-based platforms (if not HDFS). Nevertheless, many data analysts sill confides both of them to be used together and thus, Spark is said to operate on top of HDFS. All data-related processes with Spark are much faster than it is with MapReduce. With an in-memory data processing system, Spark has won over everyone’s heart as it carries out the complete data analytics at once. It just reads data from the cluster, perform analytics operations and write the output to the cluster. On the contrary, Hadoop MapReduce is a lengthier process that involves -reading data from the cluster, performing cluster operations, writing results to the cluster, reading updated data from the cluster, executing the analytics, writing the results again and so on. Henceforth, Apache Spark can be 10-100X times faster. Like we mentioned, the selection of big data software fixates to the information requirements and availability of data. The processing mechanism in MapReduce benefits enterprises if the data and information requirements are static and the system can wait for the batch-mode conversions. On the contrary, where you have applications with multiple operations, Spark is the best solution. For instance, machine learning algorithms like cyber security analytics, real-time marketing campaigns are encouraging Apache Spark. The data in Hadoop is completely disk-driven and stores everything on the disk unlike Spark (which has inbuilt memory). Due to this, Hadoop has a natural recomputation or journaling system to provide resiliency if a node failure occurs. Spark uses a different resilient storage model, which guarantees 100% fault-tolerance and data recovery using built-in resiliency, minimizing the network I/O. An important advantage coupled with Hadoop over Spark’s speed is that if the data size is larger than the memory, Spark will not be able to pull out its cache, and there is a possibility that it performs slower than the batch processing. To conclude this, we can just give an evenhanded opinion that the selection between Apache Hadoop and Apache Spark is completely user-based and bound to information requirements and availability. Having a contemporary built-in memory structure, Spark is in prominence among developers and administrators; however, Analysts still focus on employing Hadoop processing to handle bulks of data. This article is written by Vaishnavi Agrawal. She loves pursuing excellence through writing and have a passion for technology. She has successfully managed and run personal technology magazines and websites. She currently writes for intellipaat.com, a global training company that provides e-learning and professional certification training. The courses offered by Intellipaat address the unique needs of working professionals. She is based out of Bangalore and has an experience of 5 years in the field of content writing and blogging. Her work has been published on various sites related to Hadoop Training, Big Data, Business Intelligence, Cloud Computing, IT, SAP, Project Management and more. Follow her on Linkedin.